Chewing releases feel-good chemicals from the brain and keeps dogs happy busy and using up energy. 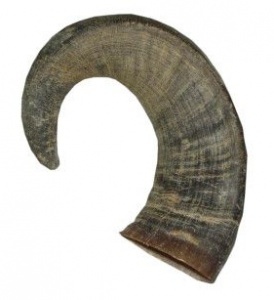 Buffalo Horns are a 100% natural long-lasting dog chew. This extra tough dog chew wears down slowly with the chewing action of the dog’s teeth and saliva into tasty morsels. Buffalo Horns only contain a tiny amount of fat (3%). Naturally they don’t contain any additives or preservatives. They are virtually odourless and they are effectively ‘raw’ and so retain all their goodness and safety. Warning: not suitable for puppies, dogs with existing bad teeth or elderly dogs. Please note these can stain carpets. 2. Minimum weight 420g (Jumbo) - suitable for giant breeds and very strong chewers.